16.75" x 13.75" x 0.75"
Coshocton, Ohio Comments: You have to love this tray. Could these puppies get any cuter? 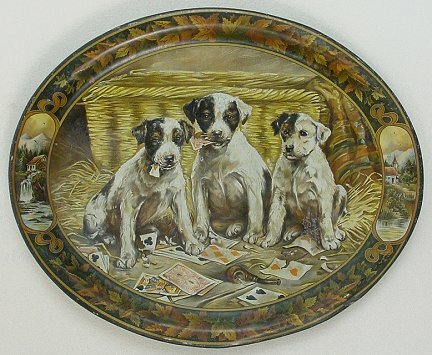 This is an unprinted stock tray from the 1900's. It was used by several breweries - see the list below. This tray was also used for liquor and Ginger Ale and quite possibly other products. There is an excellent article by Richard Hager in the Spring of 1998 NABA publication The Breweriana Collector. It is titled Meek Stock TraysCoshocton Collectibles. It gives tons of information about the many Meek and Beach stock trays and has excellent color pictures replicated from a salesman's catalog. Take a look at this link to see the transformation from a stock tray to a Brewery advertising tray. If you know of other Breweries who have used this stock tray, please e-mail me the information and picture if you have one.